Congratulations to "Joyce M.", the winner in Jannine's giveaway. Thank you to all who participated! Thanks for having me as your guest! 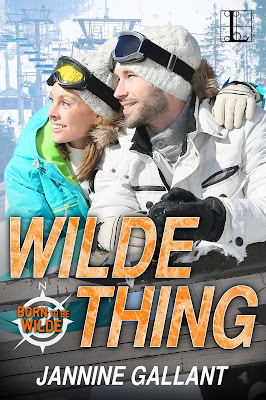 My newest release, Wilde Thing, is the third book in my Born To Be Wilde series, and I’m thrilled to share a little about it with you. I firmly believe in the concept of writing what I know, especially when it comes to location. Whenever possible, I use places I’ve lived or visited for the settings of my stories. Since this series revolves around heroes who crave adventure, I gave Tripp, my hero in Wilde Thing, an exciting career in extreme skiing. And then I set the story in my own backyard. Literally! The rising moon shed a silver light across the lake, illuminating the dark waters of Emerald Bay with its tiny island in the center. Even the stone walls of the ruined Tea House were visible against the night sky. Glimmering snow frosted the thick forest surrounding the bay. “Tripp.” Her quiet voice held a warning note. He ignored it and turned her to face him. In the moonlight, her beautiful eyes shone with a hint of uncertainty. He cupped her cheek, stroking his thumb along her jaw. The skin was as soft as he’d known it would be. She was breathless when he finally pulled back, any emotion in her eyes hidden by the darkness. I hope you enjoyed this glimpse into Tripp and Hannah’s world—and mine. What are your favorite settings for romance novels? Maybe I’ll use one of them for a future book! I’m giving away an e-copy of Wilde Thing in your choice of formats through Enthrill to one lucky commenter. Leave a comment for a chance to win, and happy reading! The Wilde brothers are addicted to the rush of adventure. But one of them is about to learn no matter how often you look for danger, you don’t want danger finding you. For extreme skier Tripp Wilde, pushing the limits is what he lives for. Unfortunately, the inherent risk takes a toll on his body. After an injury sidelines him, he ends up in the care of his little sister’s best friend, physical therapist Hannah Ryder—who has grown up in all the right ways since they last met. Hannah doesn’t mix business with pleasure, even though she harbored a maddening crush on the irresistible Tripp years before. So, while Tripp tries every slick maneuver he knows to bed her, Hannah uses her own moves to keep the hotshot skier cooled off while trying to control her own growing desire for him. After the pair witness what they think may be a murder on the slopes, along with the men responsible, no one believes their story. But when a series of unlikely accidents suggests they are being targeted, the two will have to trust in each other like never before if they are going to survive. Write what you know… I've taken this advice to heart, creating characters from small towns and plots that unfold in the great outdoors. I grew up in a tiny Northern California town and currently live in beautiful Lake Tahoe with my husband and two daughters. When I'm not busy writing, I hike or snowshoe in the woods around my home. Whether I'm writing contemporary, historical or romantic suspense, I bring the beauty of nature to my stories. Giveaway ends 11:59pm EST March 2nd. Please supply your email in the post. You may use spaces or full text for security. (ex. jsmith at gmail dot com) If you do not wish to supply your email, or have trouble posting, please email maureen@justromanticsuspense.com with a subject title of JRS GIVEAWAY to be entered in the current giveaway. No favorite setting - I enjoy reading about different locales. Changing it up is always good! Thanks for stopping by. I hope you enjoy Wilde One, Janice. These books are heavy on the adventure aspect with fun, twisting plots. Thanks for stopping by! I read a lot of small town settings but I enjoy just about anything. Love connected story books. This story definitely has a small town setting, as do most of the books I write. I don't have a lot of experience with city living, though my characters in the first book in the series, Wilde One, visit a few I've been to. I enjoy romantic suspense. You have chosen a lovely area to set the story. There is something special about the mountains and the Lake Tahoe is lovely, any time of year. I haven't snowshoed in quite a few years. It is a great workout. You're right. Snowshoeing is a great workout for both me and my dog! Tahoe is spectacular, and I love it here. Congratulations to Joyce M. who one an e-copy of Wilde Thing!